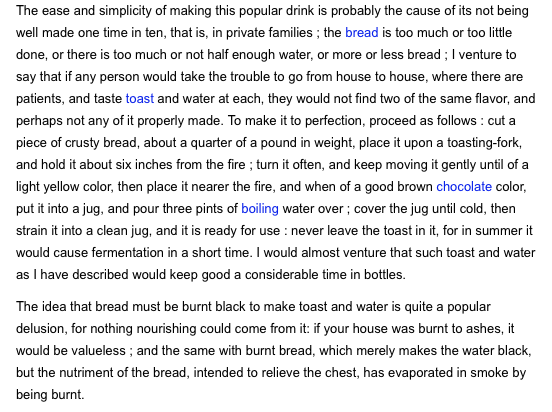 I have been told the toast and water brew was used to settle one's stomach. I wasn't sure, so I did a small amount of research. Toast water does settle one's stomach. 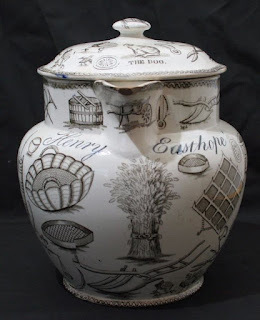 It was also considered a way to get needed nutriment into a sick person (no glucose IVs in the olden days). It reminds me of the plain toast (usually with sweet jelly) my mother used to give me when I was ill. 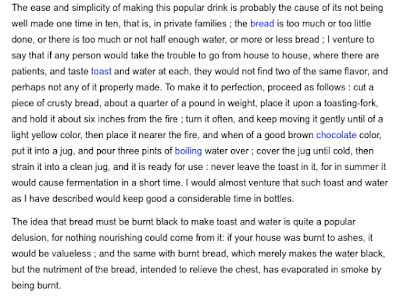 The toast, never burnt, was broken into pieces and placed in the jug. Hot water was added. When the brew cooled, the liquid was poured into a cup while the bigger bits were prevented from being poured by the strainer. 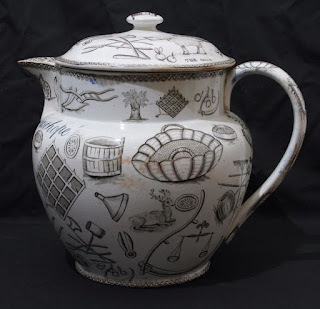 My newest toast water jug is patterned with farm implements and farm animals. 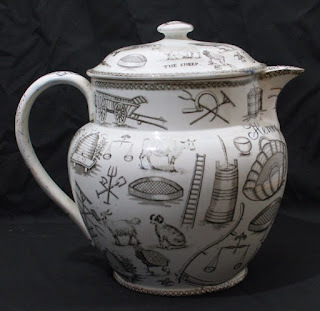 It is quite a bit bigger than my Davenport jug, which is 5 inches high. The new jug is nearly 8 inches! It also includes the name of the owner, Henry Easthope. Perhaps he suffered from severe indigestion. It is very clear that the toast should not be burnt! The excerpt above is from The Modern Housewife Or Menagere(1850) by Alexis Soyer. One more recipe, this time a modern one. It is from the blog "Adventures in thyme and plaice." 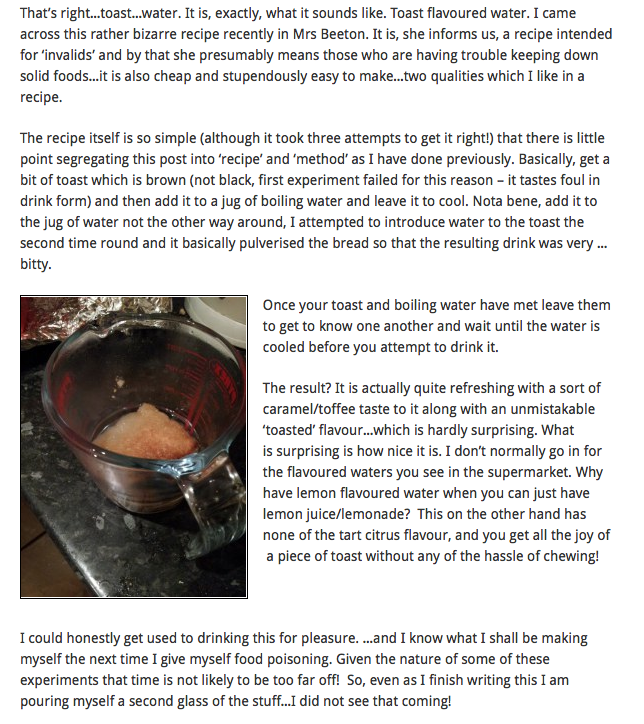 The author quite likes the taste of toast water! I may try it, although I think I shall use a pyrex measuring cup like the one below, not my 19th century toast water jugs. 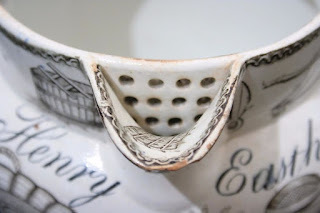 I did not realise what these jugs were for! They are beautiful - but I could not drink my mother's toast water remedy. I hated it and preferred a cup of tea and a digestive biscuit to restore me to health. I am so glad that I could be of help! Thank you for letting me know.